The One Health Community is inviting veterinarians, medical doctors, public health practitioners, and those involved in environmental sciences/environmental health to join forces and create events to be held on and around One Health Day (November 3, 2016) to promote One Health. Anyone, individuals or groups, from academic to corporate to non-profit, from students to established professionals, can plan and implement a One Health Day event. If a student, and if you like, to compete for cash prizes and global recognition of your event by renowned international One Health experts. First save 3 November, 2016 for One Health Day. Then identify and bring together like-minded colleagues and others in your region to organize and support local, creative and innovative awareness and educational events on or around One Health Day. You can focus on any topic that falls under the One Health umbrella but your event should address the inter-connectivity of human, animal and environmental health. Free use of the One Health Day logo (you might help translate it into ‘your’ regional language). Free promotional support through the OneHealthDay.Org web pages and electronic newsletters regularly circulated by the three sponsoring organizations and their partners to over 15,000 One Health advocates around the world. Event ideas and program support such as assistance in selecting speakers can be obtained via your Regional spokesperson and/or the One Health Day Coordinating Team. Financial support will not be provided. For more information about One Health Day Events or assistance with filling out the Registration form, please contact your Regional spokesperson. 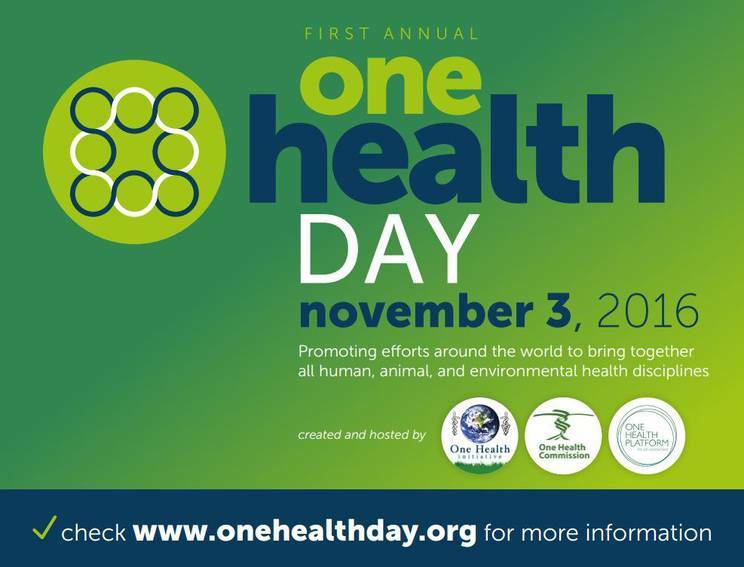 Advertise your event widely through local media in your region, by posting articles, blogposts, pictures, and/or video recordings online on the One Health Day Facebook page or on Twitter using the hashtag #OneHealthDay and on the One Health Day webpage. Contact the One Health Day social media manager if you need assistance. While anyone can participate, One Health Day especially encourages students (secondary, undergraduate, graduate, professional) to set up One Health events that facilitate student delegates working together from different academic disciplines / backgrounds. For fun and added incentive, student teams organizing an event for One Health Day may enter their event to compete for a $5,000 cash prize. Three award winning events will be selected by a jury of renowned international One Health experts. Have at least one ecology / environmental, one human medical, one veterinary medical, and one additional non-medical related student (examples: Anthropology, Chemistry, Communications, Engineering, Social Sciences, Wildlife, Zoology, etc.) N=4 or more students. Only those teams who wish to compete for the awards must prospectively meet these Event Criteria and submit to theirRegional spokespersons. All other One Health Day teams (not wishing to compete) are encouraged to register their event on the One Health Day webpage for support and help promoting their events. Student applications for the One Health Day Awards competition will be assessed for eligibility according to the conditions outlined in the event guidelines and scored using these Assessment Criteria. What if we cannot hold our event ‘on’ November 3? No problem. One Health is highly relevant and needed all year round. Hold your One Health Day event whenever you can, as close to the recognized One Health Day date as possible. Please note: if you want your event to compete for the award, it must occur in the One Health Day Events window between 27 October and 10 November.